The 36 credit-bearing activities offered during the 1989 Independent Activities Period -- although comprising a small fraction of more than 700 courses, workshops, lectures, and other programs -- marked an all-time record, according to Mary Z. Enterline, head of the IAP Office. The credit courses ranged from one-unit, one-day workshops on real estate to full 12-unit courses on genetics and intensive language studies. In addition to these 36 classes offered at MIT, three 12-unit language courses -- Chinese, French and Spanish -- were offered at Wellesley College. 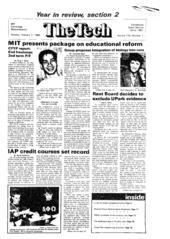 Approximately 625 students participated in the credit courses offered at MIT. Of those, about 320 took courses that carried fewer than six units, about 140 took six-credit courses, about 80 took nine-unit courses, and about 90 took 12-unit courses. The enrollment figures, obtained directly from course instructors, are not precise because several instructors have not yet received final projects from students, and thus do not know exactly how many students will receive credit. IAP has been placed on probation by the IAP Policy Committee, which is examining exactly how students spend their time during the intersession. IAP's existence depends, in part, on how faculty, administration officials, and students judge these credit courses. "A couple of years ago," said Enterline, "when the [IAP] Policy Committee met with students, a number of people felt there should be an option ... not just for credit, but [for] a more structured class." "There was indeed a desire from students for credit," she said. The number of credit-bearing courses increased from the 27 offered last year, and these were aimed more at undergraduates than the courses in past years. Enterline said that if the Committee on the Undergraduate Program does not perceive IAP to be useful to the student body, the committee may "tackle the calendar in general," perhaps shortening IAP and starting the spring term earlier. Nevertheless, "we must ensure that the Institute is providing educational opportunities for students in January," Enterline said. Reactions among faculty and students who participated in the credit courses were mixed. The consensus seemed to be that the courses were interesting and useful, but some faculty members questioned the feasibility of teaching, and learning, a full term's worth of materials in one month. "I don't know if you can do a serious 12-unit course in 31/2 weeks," said Professor Nancy H. Hopkins, who taught two courses, the 12-unit Genetics (7.56) and the six-unit Genetics and Molecular Medicine (7.57J), with several other members of the biology faculty. "I have mixed feelings about [the credit courses]," Hopkins said. "It's an enjoyable format for the students and for faculty ... but we didn't have time to correct the direction of the course." Hopkins explained that, in retrospect, the professors teaching the course saw that it had been taught at too easy a level. Hopkins also pointed to the excessive amount of time the courses required of both the students and the faculty. Her thoughts were echoed by Professor Michel Baranger, who taught Introduction to Special Relativity (8.20). "You don't realize how much of a drain [it is going to be]," he said. "It's a very efficient way of teaching, of learning ... but it must be really full-time." Twenty-five students took Baranger's course for credit, including 10 freshmen. Freshman attendance varied widely from course to course. Some courses, like Instructor Charles D. Paton's Introductory Instrumentation Laboratory, were aimed specifically at freshmen, while others, like the real estate seminars offered by the Center for Real Estate, attracted primarily graduate students. Response to the issue of compensating the instructors of credit-bearing courses varied among departments; some faculty members essentially volunteered their time. In the Foreign Languages and Literatures section, teaching an IAP course is equivalent to teaching a full-semester course in terms of an instructor's course load, according to administrative officer Phyllis Gutterman. The IAP foreign language courses are popular every year, and meet daily for three hours. Hopkins said that the question of compensation had never been formally raised, but that she expected to have her spring teaching load reduced. Faculty taught most of the courses, but some, like Professor Markus Zahn, who led Introduction to Computer Methods (10.001), said that more work should be given to graduate teaching assistants. The IAP credit courses were a varied group. There were the typical offerings, like the intensive language programs and introductory laboratory courses. And there were some not-so-typical programs. Graduate student Lawrence McKenna led a group of seven students to Death Valley, CA, for a six-unit course on the geological study of basin-formation processes. The trip, which is conducted every IAP, is partially funded by the Institute, and partially by the students themselves. Another course, "Reporting Science and Technology: Writing Feature Articles," matched students with members of the Knight Fellowship Program, which brings science journalists from around the world to MIT for a year of study. Other programs included: internships with local architecture firms; a series of lectures on the history of the US space program; "The Psychology of Queuing," taught by Professor Richard C. Larson of the Electrical Engineering and Computer Science Department; and a series of lectures sponsored by the Office of Undergraduate Programs, titled "Organizational Reality (Or: What You Don't Know Could Kill You)."